Exciting things are happening at CFHS. 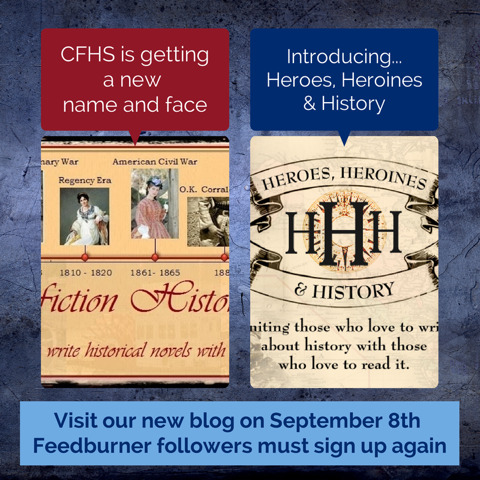 We're getting a new name that betters depicts our theme—Uniting those who love to write historical novels with those who love to read them. We'll have our big reveal on Sept. 8th. When I read that the WhiteFire Publishing was looking for stories in exotic settings, I thought about my novel, Stained Glass Windows in the Dark, set in Mexico. It's a contemporary story with lots of adventures for my heroine and hero. But, where would I go for a historical setting that oozes exotic? About that time, my husband came in to announce that he's thinking about getting another horse—a white horse from Camargue. I bet you said the same thing I did—from where? Turns out our friend, Tom, who specializes in unique, dare I say exotic, horse breeds, recently purchased a horse from the marshy delta of the Rhone River, by the French Mediterranean coast. France! Now that sounds exotic to this Colorado cowgirl. After my morning ride to count cows, I settled in to do some research on the horses and cowboys of Camargue. 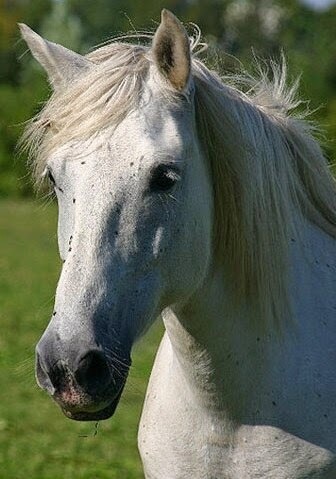 Born brown or black, the horses turn white in maturity about age four. They may be seven years old before they reach their typical height of 13.2-14.2 hands high (about 58 or "fourteen-two hands"). My favorite horse, Dakota, is 62" or fifteen and a half hands, or 15.2hh said as fifteen-two, or fifteen hands two inches. Pause for a brief note about measuring horses. The hand ("h" or "hh"-hands high) is a unit of measurement of length standardized to 4 inches. It's used to measure the height of horses in our neck of the woods, the rest of the U.S., Canada, Australia, and the United Kingdom. 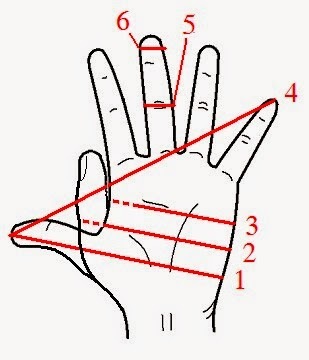 Wikipedia puts it simply: "To convert inches to hands, the number of inches is divided by four, then the remainder is added after the radix point." Read more at Hands. Conformation isn't one of the Camargue's attributes. They have plain large head, upright shoulders, short necks, long manes, and heavy tails. However, they have good depth of girth, strong limbs and feet, and short backs. Coupled with good stamina, surefootedness, responsiveness, and a friendly nature, they're a good saddle horse. Tom said "Charger" had a high-stepping walk, a bit of a stilted trot, but an even stride canter and gallop. Apparently, these are common gaits for this breed. He does have a lot of energy, power, and personality. His hooves are so tough that he doesn't need shoes. My farrier wouldn't be happy about that! 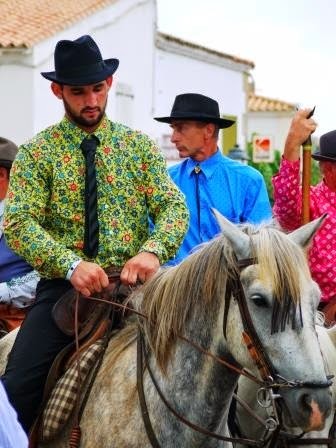 According to a tourist brochure, Camargue has an ancient and wild culture with its famous white horses, and herds of black bulls tended by the Les Gardiens, the "earthy marshland cowboys" in their moleskin leather pants, colored floral shirts, and wide-rimmed black Stetsons. 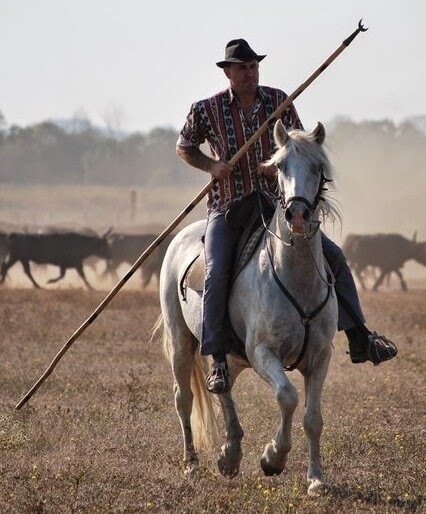 They carry a trident, long three-pronged sticks, to manage the cattle. Women are becoming Gardiens in increasing numbers. The wandering gypsies brought the Spanish influence to the region with their horsemanship, bullfights, flamingo dancing, and the paella. It's suspected that ancestors of the Gardiens may have been the first American cowboys, who sailed on French ships to the port of New Orleans where they rounded up cattle in the bayous of Louisiana and East Texas. The Camargue is home to the most ferocious mosquitoes found anywhere in France. The horses' long mane and strong, long tail would be a natural mosquito repellant. The women Gardiens never show their hair when riding, which has a lot to do with keeping gnats and mosquitoes out of their long hair and ears. The region can be compared with the Florida Everglades, without the alligators, the Louisiana bayous and the plains of Nebraska. The marshlands are shared by white horses, black bulls and pink flamingos. What's a horse and cowboy on a manade (ranch) without a bull? The Festival of les Gardiens puts the spotlight on these cowboys who rear the region's fighting bulls for export to Spain. Unlike Spain and Mexico, bulls are never killed in the Camargue bullfights. 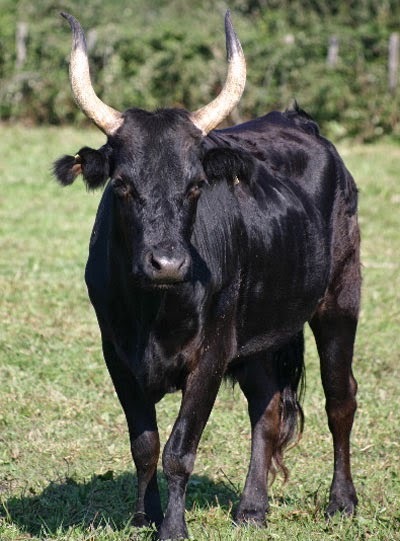 The black bulls are diminutive and lean with thick, large lyre-shaped horns, and a shiny dark brown/black hide. That aggressive look warns of a mean streak characteristic of the breed. They're fast and excellent jumpers. I'm glad our black Angus steers are de-horned. 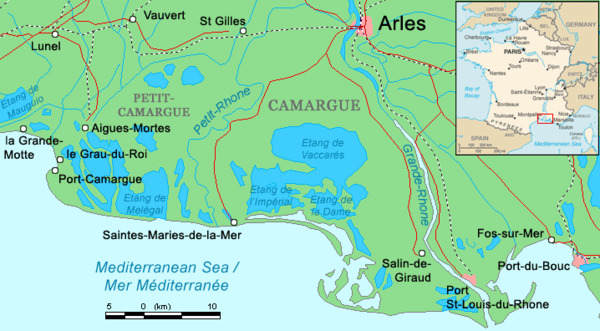 The bulls, horses, and the tridents used by the Gardiens are forged into the culture of Camargue. Created by sculptor and painter Hermann Paul, the Camargue cross embodies this infusion. 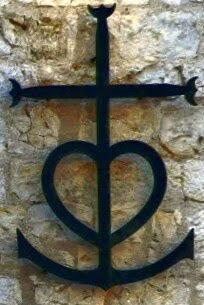 Formed with a Latin cross whose tips symbolize the Gardiens' trident and the lower end of a sea anchor topped with a heart. The cross stands for the three cardinal virtues: the cross for faith, the anchor for hope, and the heart for charity. 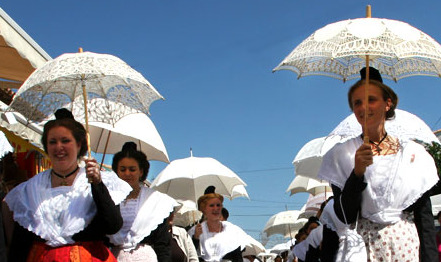 Up to age fifteen, the girls in the Camargue province wear the Mireille costume. As a rite of passage, they will wear the Arlesian costume. At the "Festo Vierginenco" event on the last Sunday of July they will trade their cap for a specially designed hair ribbon. 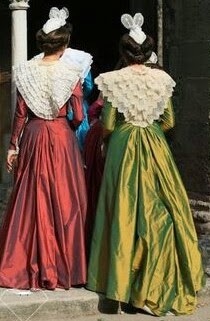 The Arlesian hair ribbon first appeared as part of their costume around 1835. 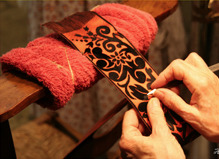 It's woven on a loom and the velvet appearance is developed in a process called sabrage using a tool called a "sword." 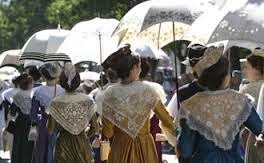 The Festival of les Gardiens also brings out the older women and their costumes—lace parasols, lace shawls, artfully tied lace hats, and elegant colorful dresses. For the Festival, the men put on black velvet jackets, colorful shirts, ties, and a wide-brimmed hat for this grand occasion. Can't you just envision a wonderful French-style, Spanish influenced, cowboy love story set on the marshy delta of the Rhone River, by the French Mediterranean coast? Where would you set your exotic story? Lin and her husband, Jerry, live on the P-R, a hay and cattle ranch, in Chimney Rock, Colorado. The only add-on to her daily wear of jeans and boots is chaps when she's on horseback. I didn't know you were a cowgirl! How many head of cattle do you count every morning? And what kind of horse do you have. We have Pure Egyptian Arabians which I'm headed out to feed shortly. Yep! Since I sat on my first horse at age three. We pared our black Angus down to 8 steers because the sparse snow fall down here last year. These will be freezer beef. There's been some rustling in our immediate area over the past couple of months and two of our high gates open onto Federal and Indian Tribal Lands. We have to ride onto the mountain, find them, and check the gates. I ride a quarter-horse, Jerry rides a paint, and we have a Percheron that pulls our wagons and sleighs. Egyptian Arabians are my absolute favorite breed. If we didn't need cattle/rodeo/trail horses, I'd press for at least one. Do you show them? How interesting that the horses turn white in maturity! Thank you for sharing the fascinating history of the horses and Les Gardiens of Camargue. You're welcome, Britney. I always equated white on a brown horse with old age not coming of age. 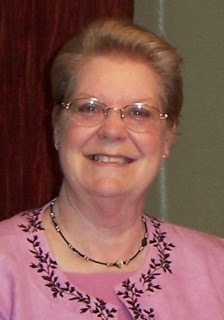 Hi, Winnie, it was new to me also. There was enough info about the women Gardiens that I want to follow up on that. They ride Western when they work and side-saddle for pleasure and festivals. You are most welcome. There is so much more about the culture that I didn't even touch on. Maybe later. Thanks for stopping by. Thank you for sharing this wonderful post! So very interesting!!! Thank you Melanie, I enjoy learning new information also, and thinking about how to explain info I grew up knowing - measuring horse height - but never really had to explain it. So glad you stopped by.